The late Ada Louise Huxtable’s last essay (Wall Street Journal, December 3, 2012) criticized the New York Public Library’s plan to remove its seven stories of stacks in the main branch at 42nd Street and Fifth Avenue to make room for a circulating library designed by Foster + Partners. While she had not been able to convince the library to show her Foster’s scheme by that date, Huxtable contended that the 19th-century iron and steel stacks were an important engineering feat and should be preserved. Now Michael Kimmelman, the architecture critic for the New York Times, argues on the front page of the newspaper (January 30, 2013) that the schematic design Norman Foster presented on December 20, 2012 has “the elegance and distinction of a suburban mall,” and is an “awkward, cramped, banal pastiche of tiers facing claustrophobia-inducing windows.” He further questions a plan where the budget of $300 million keeps rising, and asserts that the trade-off in square feet simply does not make a strong case for proceeding. 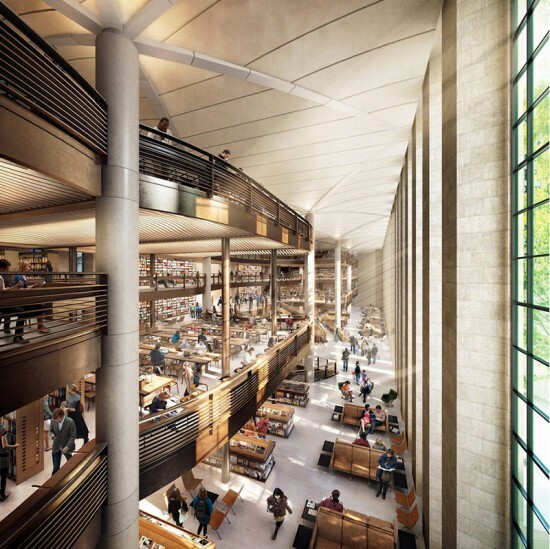 We architecture writers, editors, critics, and historians urge the trustees of the New York Public Library to reconsider their plans for the 42nd Street building. The library’s lack of transparency in involving the public in its planning process angered Huxtable, as it has us. We, like Kimmelman, are convinced the proposed intervention would do much to damage the architectural character and experience of Carrère and Hasting’s magnificent Beaux Arts landmark. The scholars among us do not object to the public or to teenagers sharing this space. But considering all the trade-offs, the library should seriously reconsider renovating the 40th Street branch for a circulating library where Foster’s talents could be used more appropriately. Why is the board of the New York Public Library in such a rush that it remains deaf to the well-publicized misgivings of so many in the community? Before such an irreversible decision is made, we ask the board to stop and open the proposal affecting such a significant public institution to significant public discussion.